This young man has celebrated his first day at school with a trip to a photobooth to show off his first day presents – two School Cones. He doesn’t look especially pleased in this picture but he should have been. 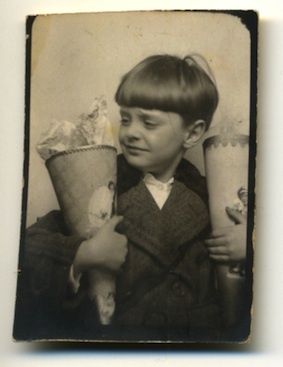 A “Schultüte” or School Cone is a paper or plastic cone of gifts. 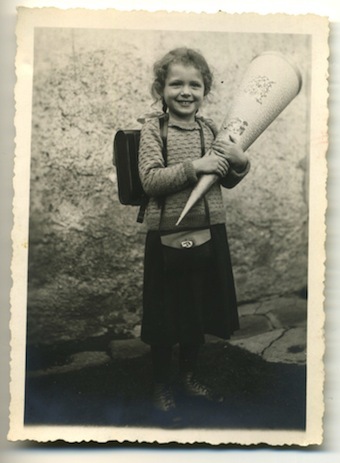 When children in Germany and Austria set off for their first day at school, their parents and/or grandparents present them with a decorated cone that is filled with toys, chocolate, sweets, school supplies, and various other treats. The tradition of the Schultüte can be traced back to Saxony (around 1810) and continues to this day. Below is another photo from my collection of a little girl with her cone. She is looking more appropriately happy than the little boy. Cool post with a tradition which is brand new to me. The little girl is really cute. Yes, it was new to me too. I am learning a lot from my photo collection as I had no idea what he was holding until the seller of the booth pic explained it to me. me too – i’d never seen a ‘school cone’ before, but i can tell you, i need one for my own collection! Isn’t it a shame it isn’t an international custom. It is very cool! Maybe the boy ate all the chocolate and has an upset stomach. That’s what I would have done if I got candy for the first day of School. Yep, I think you are right. Or maybe his older sibling had just grabbed some sweets from the top and he just noticed! Katherine, your blog is just a mine of information. School Cones eh? Maybe the little lad is miffed because his cone is full of useful stuff for school and there’s not a chocolatey treat in sight. Maybe they are not even his cones? Maybe he’s desperate for the loo? Maybe he’s just a spoilt brat. Maybe I’ll shut up now. I think he is miffed cos a sibling has just pinched some of his loot off the top! Great cones, the little lad seems to have suffered the dreaded bowl haircut! Gives him a bit of retro coolness, I think! Nice pictures! I like the one of the boy. He does not look unhappy to me. More like he is concentrating – probably on doing what he is told. Wanting to get it right. Not being a former boy, I think I will agree with you! the lucky little blighters! I don’t remember getting one of those cones! Lucky indeed! These days some kids get electronic goods instead of sweets. Good to see you back. Does this mean we can expect more posts? It’s been about 6 months, was everything alright? Funny vintage pictures !! In fact , I have also an old black/white picture taken from me , dressed up for going to school ( holding a small vintage leather briefcase for some school books ) . I am fascinated by old black and white pictures . I buy sometimes some pictures from the 1900-ish years , on second hand markets ( German = Flohmarkt , Trödelmarkt ) . And then I start wondering about the gone youth of all these people . There is definitely a story of past youth and fun in these old photos. I am glad you are buying some. So many have been lost to rubbish bins and incinerators. Best wishes for Xmas. As opposed to the Dunce Cap, which originated with the philosopher, John Duns Scotus. The pointy hat starts as an emblem of erudition and complex analysis. When the Duns Men fell out of favour, the hat became a symbol of ridicule and and false thinking. Wonder if the bountiful cone of “Schultüte” was inspired by as an inverse of the Dunce Cap that was very popular as an educational tool in Victorian England. Thanks Joseph. Is all that true about the dunce cap. I will have to post one of my postcards on my Mugshots blog of a group of children wearing what look to me to be dunce’s caps but are also obviously not, in the context of the photo. Yes, first heard about Duns Men and Dunce hat when studying philosophy. Was not aware of the bountiful cone till your post.